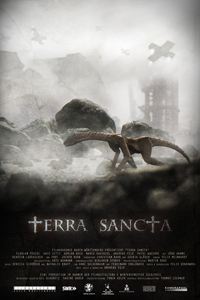 As a follow-up to Lux Aeterna, Terra Sancta was created as a second-year project during the Filmgestaltung 2 term at the Filmakademie Baden-Württemberg. The entire production time for the short film was constrained to 4 months, from the earliest concept to the final rendering. In order to avoid the risk of unsatisfactory VFX work, early plans to shoot background plates for real were abandoned & a graphic-novel-esque look was preferred utilizing CG environments, while the remaining footage shot in multiple layers in front of a greenscreen. Due to a relatively enlongated preproduction time & comparably late shooting schedule, the post production lasted only for about a short 6-7 weeks. The 40 character shots alone had to be animated within 3 weeks, which required training & research in 3ds max CAT & the usage of displacement mapping.